Gekko Acoustic Box Fan 6" 150mm Gekko Acoustic Box Fan 6" 150mm is available in 2 models 1000 m3 and 1500 m3 - It doesnt just look the part, its an all round solid quality fan from the fittings to the motor, they run at extremely low noise levels while moving incredible amounts of air, we h..
Gekko Acoustic Box Fan 8-inch (200mm) 1000 m3/hr Gecko acoustic fans don't just look the part, they've been designed and engineered to operate at extremely low noise levels while moving incredible amounts of air. 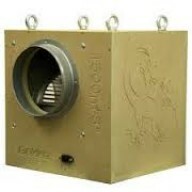 They are premium quality products, assembled in the UK using precision engineered co..
Gekko Acoustic Box Fan 10-inch (250mm) 1500 m3/hr Gecko acoustic fans don’t just look the part, they’ve been designed and engineered to operate at extremely low noise levels while moving incredible amounts of air. They are premium quality products, assembled in the UK using precision engineered..
Acoustic Box Fan (10") Fans 2500m3 High powered acoustic box fan moving 2500m3 of air. The MDF Box Fan is one of the quietest high powered fans on the market using Torin motors, MDF wood is built around the fan ensuring minimal noise. ..
ekko Acoustic Box Fan 12-inch (315mm) 4250 m3/hr Gecko acoustic fans don’t just look the part, they’ve been designed and engineered to operate at extremely low noise levels while moving incredible amounts of air. They are premium quality products, assembled in the UK using precision engineered co..